About five kilometers south of Fira Town on the way to Akrotiri, the lovely area of Megalochori features beautiful Caldera views, excellent accommodation, and access to the public bus operating between Fira Town and Akrotiri. 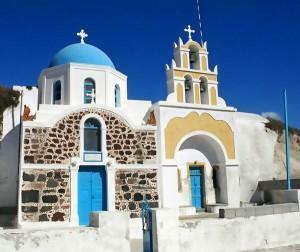 It has a lovely village, which is home to the Boutari Winery, one of Greece’s largest wine exporters. The resort overlooks 70,000 square meters of vineyards, and has a view toward the Aegean Sea and the magical Santorini sunsets.